A few kilometres from Simmern, quite remote and on a very exposed site above the village of Sargenroth, is the Romanesque Nunkirche, one of the landmarks of Hunsrück. 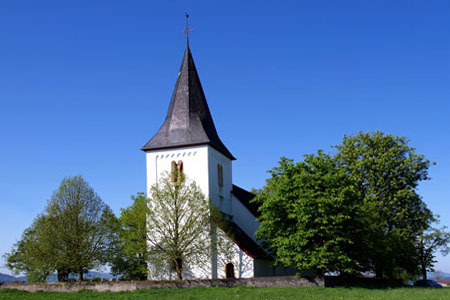 Its name is probably derived from the medieval "Nuwe Kirche" (new church), which the townsfolk used to differentiate it from the churches in Simmern or Kirchberg. Built around the year 1000, Nunkirche was a part of the long-term development plans of the politically-minded and very ambitious Archbishop Willigis of Mainz (975-1011), who, at the time, was putting a lot of energy into the development of the high-lying region of Hunsrück from the south. This was primarily to distinguish himself from the Trier Electors, who, at about the same time, began to spread their influence from the west, over the Mosel-Hunsrück region towards the Rhine. The frescos, as well as the paintings on the walls and vault of Nunkirche, dating from the 13th and 14th Centuries, are among the oldest in the Hunsrück region. From the medieval pilgrimage church, devoted to the holy Rochus, only the Romanesque tower has survived with its two stories, while the original third story was replaced by a spire with an unusually bent roofline. The nave was rebuilt in 1745. It was here that the regional law court of representatives ("Hundertschaftsgericht", "Hundgedinge") from the nearby Ravengiersburg monastery met in the open air during medieval times. Next to Nunkirche is the "Rochusfeld", one of the largest orchards for some distance For centuries, at the beginning of September, the cattle and flea markets were held here. Until a few decades ago, this "Nunkirche market" was still the most important folk festival for the entire Hunsrück region. Every year, during the first weeks of May, Rochusfeld provides a colourful display of a special variety of orchids, ranging from deep red to violet. It is the season of the Spotted Orchid ("Manns-Knabenkraut") with thousands of bright, radiant blooms. Nunkirche was considered to be the mother church of the nearby Ravengiersburg monastery in the valley below, whose history is closely linked with the development of the parishes of Simmern and Kirchberg. Until the end of the Middle Ages, Ravengiersburg was one of the largest seignories (feudal lordships) in the region and as such had considerable influence on the development of one of the central areas of Hunsrück. The monastery church here, known as "Hunsrück Cathedral", with its mighty Romanesque double tower is a landmark that can be seen from afar. Its Baroque altar, 11 meters high, dates from 1722 and is one of the most beautiful in Hunsrück. The monastery was built from a fortress dating from 932. It is notable that the name "Hundesrucha" appeared for the first time in the foundation charter of the monastery in 1074. The name Ravengiersburg is attributed to the nobleman Rabangar, who built the original fortress on the steep rocks above the Simmerbach river. A highly recommended route is the approximately one-hour hike from Nunkirche to Ravengiersburg; either the direct route or over the village of Belgweiler, where the path down from the village of Oppertshausen to Ravengiersburg gives you an excellent view of the grandeur of Hunsrück Cathedral.